Ever the little princess- as evidenced by the tiara and pink, frilly dress-up gown pictured above- Lil' Miss loves all things girly. So, the pink Nuby Flower Child™ Feeding Set is right up her alley! 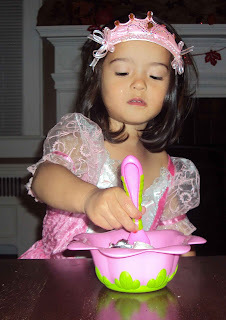 As soon as we opened our box of Nuby Mommy Blogger goodies, Katy immediately gravitated toward the pink, flowery plate, bowl and silverware set. After a somewhat traumatic morning of allergy testing, we chose to do something "special" for dinner and eat dinner in the living room (living on the wild side, I know ;-P) while watching Madagascar 3. Of course, Katy's pizza dinner had to be plated on her new Nuby Flower Child™ Feeding Set. Not only did Katy have fun eating off her new dishes, but I have nothing but praises for it! -Cute, fun flower design that appealed to my daughter and encouraged her to eat her meal. -Rubber "feet" on the bottom of the bowl and plate that allowed for them to stay put (even with the constant ball of motion my two-year old can *sometimes* be). -I still cut up Katy's food into bite-sized pieces. I used a regular butter knife on the plate and didn't notice any scrapes or scratches after the first use. I'm sure that some will appear after time, but I've also experienced plastic plates that look scratched up after only one use. -As I mentioned above, we were eating pizza for dinner. I didn't notice any red leftover stains on the plate that sometimes appear on plasticware.